Y Combinator founder Paul Graham is a father figure to countless startups he’s helped accelerate, but had never taken a board of directors seat until now. Today he announced he’s accepted board seat with Watsi, a site that lets people donate money to pay the medical bills of needy people. Watsi came out of this season’s Winter 2013 Y Combinator class and is the first non-profit it’s ever backed. 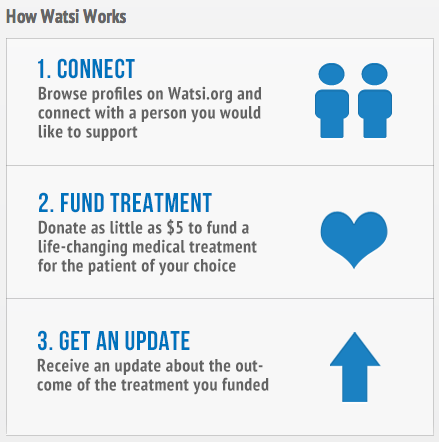 More specifically, Watsi hosts profiles of people in dire need of medical care, but who can’t afford it. Donors can browse the profiles and donate as little as $5 to help someone get well. 100% of donations go to the sick, and Watsi funds its operations and even pays credit card processing fees on donations out of its own pocket. We named Watsi one of the top seven startups from the last YC Demo Day. For the first time I agreed to be on a board of directors: @watsi's. We’ve reached out to Graham for comment about why he accepted the position. But he had already been showing the startup some love. When terrible things happen to people I can't help, I go to http://t.co/tYt9sGGPN4 and help people I can. Beyond a few advising investing roles with companies like 280 North, he’s known to devote himself fully to Y Combinator. He could help Watsi navigate the balancing act between being a startup designed for rapid growth, and being a non-profit with a mission for social good.